Many allergens or other hazards commonly found in the home can be detrimental to the health of all but especially so for the respiratory patient. We love our pets but frequent vacuuming is important. It’s also essential that Fido gets washed, brushed, and groomed regularly, preferably by someone other than the respiratory patient. Perpetually damp surfaces are breeding grounds for mold and bacteria. Seal up leaks right away. Wipe up spills especially in carpets or fabrics. Install fans in bathrooms to improve ventilation. In humid climates you might consider running a dehumidifier or air conditioner in the house. 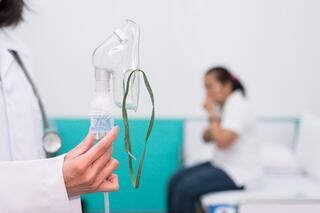 Anything with a strong smell is likely to irritate nasal and throat passages. Stick to lightly scented or even un-scented products. If you have a friend who is known to wear excessive perfume or cologne, politely explain to them why and request they do not wear it to your home. Dusty surfaces irritate the respiratory system and many are also allergic to dust making it an exacerbation risk. Don’t collect an abundance of newspapers or magazines. They collect dust as well as moisture, creating mold. If a family member participates in a hobby that creates an excess of particulates, such as wood working, be sure they do it in an area that can be blocked off from the main living area, such as a garage or shed. Have air ducts cleaned regularly. Consider area rugs instead of wall to wall carpeting. They are easier and cheaper to replace if they get damp and they can be taken out and cleaned. As we mentioned, cleanliness is important but the use of harsh chemicals is not essential for a clean house. Anything that contains bleach or ammonia should be avoided. Wiping and mopping surfaces with warm water and mild dish soap if sufficient to keep surfaces clean when done regularly. Keep rooms well ventilated particularly while cooking or cleaning. If possible, people with COPD should let others do the sweeping and scrubbing with any kind of chemicals. Yes, you can tell them we said so. If you do have to have any exposure to cleaning chemicals, be sure to use a respirator mask that is rated N95. The CDC does a great job of explaining mask ratings on their website. There are several cleaners marked as all natural or non-toxic. If you can use these without respiratory irritation, that's fine but you may save money and also reduce risk of symptom flare ups by using these items that most people already have in their cupboard. Mix 1/2 gallon of water with 1/2 Cup of Vinegar and 1/4 Cup of Baking Soda. Use on kitchen counters, chrome fixtures, mirrors, or to remove water deposits from the sink or shower. Mix 1 part hydrogen peroxide with 2 parts water. Spray on surface and let sit for 1 hour then rinse with clean, warm water. For stubborn grout stains mix 1 part vinegar with 1 part warm water. Make a paste with baking soda and water and spread it on the grout. Spray it with the vinegar solution. Let stand for 5 minutes then scrub with tooth brush. Caution: Vinegar can break down grout so only use this method on occasion. 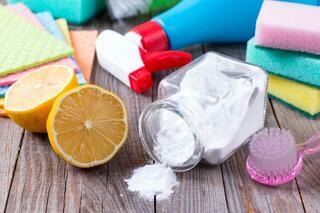 Lemon juice mixed with cream of tartar can also be used to clean grout. Simply make a paste, apply with toothbrush, then rinse with warm water. 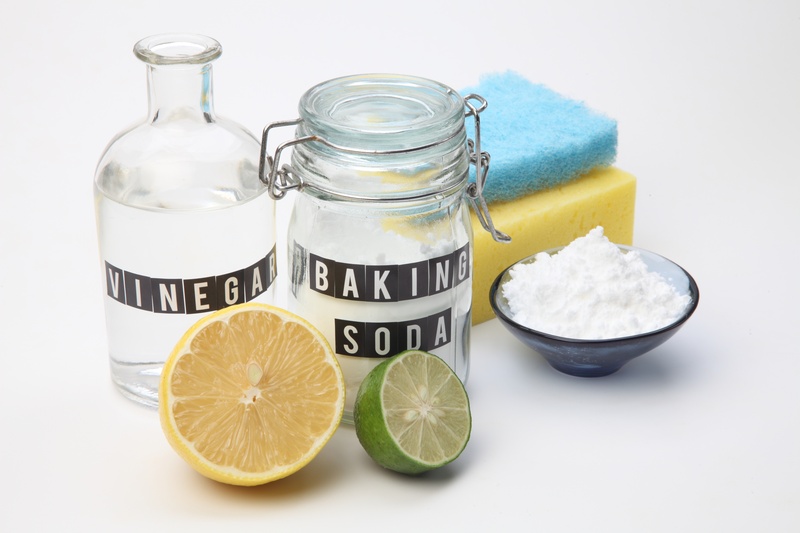 Mix 1 cup of white vinegar with 1/2 cup of baking soda and 1/2 teaspoon of tea tree oil to kill bacteria. Spray this mixture on the outer surfaces of the toilet including the handle. Let sit for several minutes then wipe with damp cloth. Spray the mixture into the bowl and let sit for 10 minutes. Sprinkle baking soda in and scour with toilet brush. Either slice a lemon or pour in 1/4 cup of lemon juice into a bowl of water. Set microwave for 45 seconds. Wipe with damp cloth. Squeeze lemon or pour lemon juice into containers. Add baking soda but not enough to make it pasty. Scrub. For stubborn stains, let sit overnight then rinse. Mix 3/4 cup of baking soda with 14 cup of water and 1/4 of salt. Wipe oven with damp cloth and apply paste. Let sit overnight. Remove the majority of paste with spatula and wipe clean with wet cloth. Polish with steel wool as needed. Apply toothpaste or mayonnaise to the ring and gently buff. Be careful not to mar the surface. Once ring is gone, buff entire surface. Sprinkle with baking soda and let sit for 15 minutes. Vacuum. Mix olive oil with a few drops of lemon juice. Apply with cotton rag. Let sit for a few minutes then buff and shine with a clean cloth. Pour 1/2 cup of baking soda in a bucket of warm water. Mop and then rinse with clean water. Sprinkle salt over the stain. Soak the salt with juice from a lime. Let sit for 3 hours then scrub clean with lime rind. Rinse with warm water. Mix 4 tablespoons of lemon juice with 1 gallon of water. Spray on and wash as normal. Apply corn starch and let sit for several minutes then vacuum. Repeat as necessary. As you can see you can clean your entire house with just a few simple items. We hope these tips keep your home clean and yourself healthy as well.